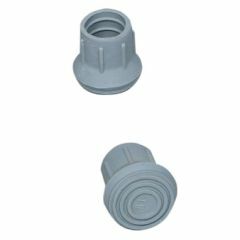 Walker/Cane Replacement Tips are rubber tips provide added stability to walkers, canes and commodes. Fits over the end of most leg or cane tubing. Contains latex. I ordered 7/8 inch tips for my two walkers. I could not fit them over the ends of the legs so I called Allegro back and she sent me 6 boxes of the 1 inch glider tips. I am very satisfied with the new order. Once I got them on, I have had no problem using them. I will definitely order these again.